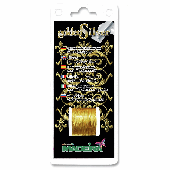 Madeira Golden Silver Embroidery Thread. 100m . 2% Silver. Silver-metalised noble embroidery thread. For machine embroidery, decorative sewing and hand embroidery.